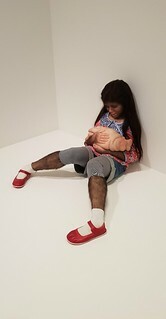 Last year I visited GOMA after work one afternoon to see the Curious Affection exhibition, which was amazing. Quite unsettling, but also totally intriguing. I lucked out, when I got there the artist herself just happened to be giving a guided tour, so I jumped in and it was so good! This was my favourite piece, called 'The Comforter'. I took a lot of photos, but I will just share one more here. You can see how they are somewhat confronting yet fascinating. By the time I left, it was time to think about food! I was walking back to my car in West End, where there are many vegan and vegan friendly places. It was still pretty sunny, so I decided to walk down Fish Lane as it was shadier. I ended up walking past Wandering Cooks, which is kind of a place where food businesses can start up, using the kitchen, or selling food. I'm not describing it well, so check out the website. They often have some vegan stuff there, so I popped in and saw that Indie Treats was open. They have a small menu, that changes, and is mostly vegan. I got some food to take away. 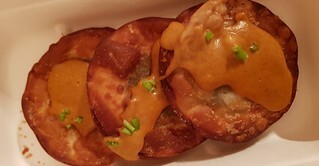 The Crispy Fried Dumpling Nachos were filled with black beans, coriander, and pickled radish, and topped with a cashew queso. I got them to leave off the coriander. Even with cooling down a bit on the drive home, they were good! I'd love a huge bowl of these. I also got the Korean Noodle Bowl. 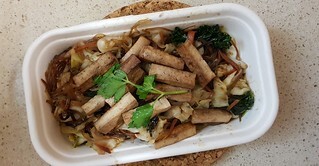 Sweet potato noodles (I love these) with veggies (I did have to pick out some capsicum), tofu, and a garlicky brown sauce. So lovely. 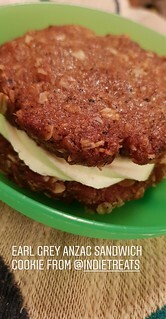 I also picked up an Earl Grey Anzac Sandwich Cookie for dessert, which was delicious! Forgive the photo, I realised I didn't take a proper one so this is saved from my Instagram stories. Oh, wow, the dumpling nachos sound incredible! 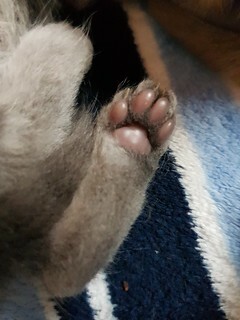 Kitten toe beans; too sweet! They are just so teeny and perfect. All our kitties once had toe beans this tiny. The dumpling nachos sound AMAZING!! I recently tried sweet potato noodles and I agree, they are really, really good! I could definitely do with more dumpling nachos in my future. Mmmm so yummy! Those dumplings look interesting.